Watch out for the volume change! I get caught in a few occasions that my predictation using technical indicators went haywire when there were sudden drop trading volume. On Aug 6, everything looked good on this chart. 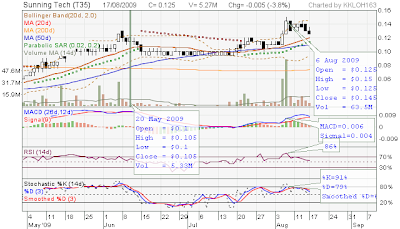 The stock price breakout from consolidation and broke the resistance of $0.13 with 63.5M shares traded. The stock price was above 20D, 50D and 200D MA, at the upper Bollinger Band, on top of the Parabolic SAR, MACD confirmed bullish convergence, RSI & Stochastic were bullish. All Standard Six indicators showed bullish convergence and looked really good to enter the position. The next day the volume dropped to 14.2M shares and end up with a bearish marubozu candle. For the subsequent days, the volume getting lower and lower and out of the sudden the stock was losing momentum. Now I have to hold on this stock as a longer term investment. When I first started investing…. I have been “investing” in stocks since 1998, but maybe a more appropriate work is “buying blindly”. What I did was to hear from my colleagues what shares to buy and just throw my hard earn money to buy the stocks he recommended. I did not know how to analyse & evaluate a company, did not know how to analyse the stock chart & totally lost with those jargons like support & resistance, correction, candle sticks, etc. I was just like those retail “investors” out there (uncles & aunties) and did not even know what kinds of risks I was putting myself into. I bought Keppel Land, UOB KayHian, Chartered Semiconductor (when the stock price was S$10! ), JIT (later acquired by Flextronics) in my initial first few years of investing. As expected, I lost money and I am still holding my Charted Semiconductor share today! But I have started to average down my ChartedSc stocks as I know semiconductor recovery is around the corner and I can minimise the loses when the stock price goes up. Recently I decided to take up some investing courses and it reaps benefit. I’ve learnt how to analyse a good company and evaluate the stock price whether it is under value or over value. I also learned how to use Technical Analysis to analyse the stock price trend to time my entry and exit points. I decided to share my learning experience and stock analysis in this blog space after encouragement from my classmate. I will be sharing some company analysis and stock charts I have done. Welcome for any comment as this will help me to learn.